The man viciously attacked by two now-convicted police officers in the triage area and a patient room at St. Joseph’s Regional Medical Center has filed a lawsuit against the city, his attorney, Steven Greene, said on Wednesday afternoon. Andrew Casciano is seeking an unspecified amount in compensatory and punitive damages. His lawsuit stems from a Mar. 5, 2018 incident. Casciano called 911 for emergency assistance after attempting to commit suicide. He was taken by an ambulance to St. Joseph’s Medical Center. Two officers, Ruben McAusland and Roger Then, responded to his home and followed the fire department ambulance to the hospital to monitor him. Two videos captured at the hospital that night shows Casciano in a wheelchair. In the first video, captured by the hospital’s surveillance system, the victim throws an object down the hallway. 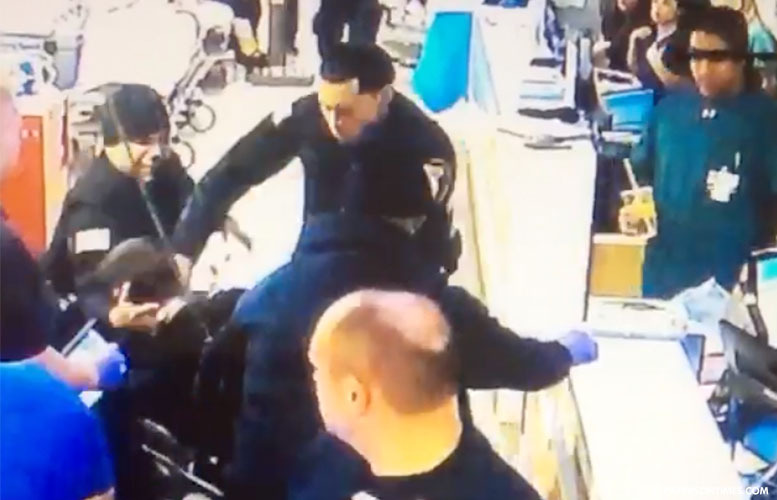 Angry at the victim’s conduct, McAusland pushes the wheelchair with his hands and punches the victim in the face. As the victim fell towards the ground, Then grabbed him by the back of the neck and pushed him towards the ground. “You have the right guy today,” responds McAusland. Then turns the cellphone towards himself and smiles. Both officers submitted false police reports that did not include their attacks on the victim. The FBI stumbled on the video of the assault while investigating corruption in the police force. McAusland received a 66-month prison sentence for his assault on Casciano and dealing drugs using his squad car. Then tried to cover up McAusland’s crime by filing a false police report. He was sentenced to six months in prison. A federal judge ordered both convicted felons to pay $32,892 in restitution to Casciano to cover his medical expenses. McAusland’s punch badly damaged Casciano eye socket. He sustained injuries to his face and required surgery. He continues to suffer from headaches and post-traumatic stress disorder. Casciano’s attorney filed a claim notice with the city seeking $4 million in damages. His case has been strengthened following the conviction of the two police officers. The lawsuit names City of Paterson, McAusland, Then, police chief Troy Oswald, police director Jerry Speziale, and John Does 1-5 (jail officials, supervisors, and others). The lawsuit alleges the city is failing to properly train and supervise police officers. It also states the police Internal Affairs Division, which investigates complaints against officers, is broken. Complaints are dealt with “bureaucratic power and official denials calculated to mislead the public,” says the lawsuit. Police often fail to forward evidence of criminal acts committed by police personnel to the Passaic County Prosecutor’s Office for prosecution, according to the suit. Police brass have said the FBI investigation that led to the two convictions originated from within the department. Municipal officials declined to comment on the lawsuit. The city of Paterson should settle this one very quickly as this is a mortal embarrassment. I would suggest that they don’t let this go to a jury. Get the lawyers together start the discussion let the tax payer hear it.